Are you trying to decide what to do during your stay in the Classic City? Look no further, because there are plenty of things to do in Athens, Ga for your weekend away, especially when you have tips from an insider! Whether it’s visiting famous landmarks, strolling through gardens, or taking interesting pictures, Athens has you covered. What better way to start your time in Athens than visiting the most iconic spot in town? Make sure to walk around the arch rather than under it if you haven’t graduated from UGA! Probably the coolest tree you’ll ever see, this white oak tree legally owns itself and the land eight feet around it! Even “Ripley’s Believe It Or Not!” has featured it, making it one of the most famous trees you’ll probably ever see. Make sure not to linger long though, since it’s in the middle of a residential area – sitting right in front of someone’s house! Do you have some great news you just have to celebrate? Do you just feel like having a bit of fun? Well, the Chapel Bell is here for you. Go ahead and ring it – anyone can do it! You might have to put your whole body weight on it though, it’s heavy! If it’s nice and sunny outside, you’ll most likely see some people lounging on Herty Field. Bring a blanket and some food and enjoy a relaxing time in the sun. While you’re here, you can also check out the Herty Fountain, a popular spot for Athens-based photoshoots. This spot is further away than any of the locations, but it’s definitely an Athens staple. The Iron Horse sits in a large field, perfect for you to take some fun scenic pictures and horse around. Try climbing on top of it, because this is the type of art you can touch! Who can forget the most cherished land in Athens? This massive stadium is the home of some of the Bulldogs’ best and worst games, but it’s a massive part of the UGA college experience, nonetheless. Even when it isn’t football season, it’s still fun to visit and take pictures! What does every quirky town have? Fun, Instagram-worthy murals, and Athens is no exception! There are tons of murals to choose from, but some iconic ones are The Last Resort, Pulaski Street Phoenix and the Tate Student Center Mural. There are plenty of murals to find around Athens, so make sure to keep an eye out for them wherever you go. Are you a fan of R.E.M.? Well, then you must be a fan of Wuxtry Records. Peter Buck worked in this record store when Michael Stipe came in as a visitor, and the rest is history. Not only is it cool to visit the birthplace of such a well-known band, but it’s also a fun store if you like vinyl. They have cases on cases on cases of vinyl records, you could easily be entertained for hours looking through the varying vinyl! Is your sweet tooth tingling? Try stopping by Hodgson’s Pharmacy, located in 5 Points, for some ice cream. This place is an actual pharmacy, but has a great ice cream bar, just like the old days! So you’ve been traveling around Athens all day and your energy is beginning to lag. What better way to get a caffeine kick than visiting Athens’ own Two Story Coffee! This little coffee shop has a cozy atmosphere and some amazing hot drinks. Try the iced mocha, it’s a personal favorite for those hot summer days in Athens. We can’t leave Athen’s own Jittery Joe’s off the list…At one time Jittery Joe’s was the official coffee of Antarctica. According to Rolling Stone Magazine the #5 underground album of all time is “Live at Jittery Joe’s ,” and Rolling Stone Magazine also named Jittery Joe’s one of the top 24 hour coffee houses in America. Athens is known for its music scene, so what better way to celebrate your time here than go see a concert? Georgia Theatre and 40 Watt host many concerts for both local bands and well-known artists. There are more venues around town, but these two are the most prominent in Athens. If you’re in the mood for a movie, look no further than the Tate Theatre! This movie theater is a great date night spot because it’s free for UGA students. If you aren’t a Bulldawg, have no fear, because your ticket will only cost $3! Don’t forget to check their calendar first and see what’s playing that night. Improv Athens is one of the top eight improv troupes in the United States. The troupe consists of UGA students, but don’t worry, their shows are open to anyone and everyone! Stop by the Miller Learning Center on Fridays from 7:30-8:30 p.m. or 9:00-10:00 p.m. for some lighthearted humor and outrageous laughs. Ciné screens films from all different genres, eras and countries, which makes it an extremely unique spot in downtown Athens. It’s much smaller than a run-of-the-mill movie theatre, but it’s coziness gives it character. They also have a bar/cafe for when you get those mid-movie munchies! Another unique landmark in Athens is the Double-Barreled Cannon. The cannon was created during the Civil War and though it was never used in a battle, it still made it’s mark in Athens. It sits in downtown Athens right beside the Athens-Clarke County City Hall. The State Botanical Garden of Georgia was named the #7 best botanical garden in the United States by USA Today, and there’s no wonder why. Try walking the long and sprawling trails, sipping coffee at the arboretum, exploring the chapel, or just admiring the beautiful flowers and fountains! On a sunny day, this place is easily one of the prettiest sights in Athens. If you love the arts (and cool A/C on a hot day), make sure to check out the Georgia Museum of Art. GMOA houses many exhibitions, including traveling exhibits, so even if you’ve been there before, there’s a large chance you’ll see something new. They also have a pretty mini cafe on the first floor with some delicious pastries. If you’re more into learning about history, make sure to stop by the UGA Special Collections Libraries. You can peruse historical maps, books, manuscripts and so much more. You’ll leave the building with a much better understanding of historical Georgia than when you walked in. This 2.5 acre garden was created in honor of the first gardening club of Georgia. The Founders Memorial Garden is home to intricate shrubberies, beautiful landscaping and a picture-perfect staircase. What more could a garden lover want? If you love animals and the outdoors, then this is the place for you. Bear Hollow Zoo is a free zoo with tons of cool animals like a bald eagle, a bobcat, and, of course, bears! Check out the reptile house if you want to see some slithering and slimy animals, too. If touring the classic city seems more worthwhile to you, check out Classic City Tours. The Athens Heritage Tour and the Museum Mile Tour of Historic House Interiors offer a glimpse into the history of Athens. Through these tours, you will learn the rich history of Athens, and see unique architecture on historic Antebellum museum homes. “We Let The Dawgs Out” is an art exhibit around Athens that consists of bulldog sculptures painted in different ways. You won’t just find these bulldogs on the UGA campus, though! All around Athens are fun bulldogs you can take pictures with. Some of my favorite bulldogs are located at Chastain Building, Baxter Street, and the College of Pharmacy, but there are also many others to look out for! Can you find them all? The greenway is the best place to walk your dog, go jogging, have picnics, or simply explore the nature around you. You’ll wander on the paved path along the North Oconee River that runs through the greenway. If you’re looking for some fresh air on a leisurely day, this is the place to go. If you like to play golf, try snagging a tee time at the University Golf Course. You can play on the same golf course that notable alum like Bubba Watson and Chris Kirk once played on… How cool is that? The 18-hole course is open to the public, so don’t sweat it if you’re not a Bulldawg! What better way to remember your time in Athens than with some UGA swag? The bookstore has everything bulldawg-related that you could possibly dream of. Even if you don’t want to buy some merch, it’s definitely worth a visit to get you in the UGA mindset! If you truly want to get a taste of Athens, head over to the Athens Farmers Market Saturdays at Bishop Park and Wednesdays at Creature Comforts. Many Athens vendors join this event, meaning you get to see the true Athens experience. And don’t worry, they sell more than just fruits and veggies! If you’re a fashionista looking for some outfits to add to your closet, Athens is the perfect place for you. Stores such as Agora Vintage, Dynamite Clothing, and Atomic offer classically-cool vintage clothing at affordable prices. Most of Athens’ vintage stores are downtown, meaning you can shop until you drop without running around the city! Still looking for something else to do? Try chowing down at a unique local restaurant! Athens has loads of options when it comes to dining. You can try out some new styles of food, or stick to the classic hamburgers and hotdogs that you love… Whatever you’re craving, Athens has it. And if you plan to stay overnight in Athens, be sure to check out lodging discounts from our partner Hotels.com. Becky Burgess is a student at the University of Georgia, majoring in journalism at the Grady College of Journalism and Mass Communications and minoring in fashion merchandising. She is the first American-born female on both sides of her family, and loves to travel to England, Scotland, Wales and France to visit her extended family and explore her family history. Because of this, Becky has had a love of adventure and travel from a young age, and enjoys exploring the nooks and crannies of every city she enters. She currently resides in Athens, Georgia, but hopes to one day travel the world and document her experiences. 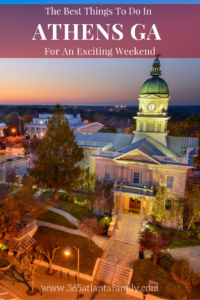 Be the first to comment on "The Best Things To Do In Athens, Ga For An Exciting Weekend"